On the other side of the (interrupted) hostilities, we have a handful of Decepticons still operating on their own agenda! In particular I was happy to see Soundwave, always one of my favourites, trying in his own subtle way to remain useful to the 'Cons, stationed on Cybertron and stirring up trouble. He's contacted by another infamous Con, the "Master of Metallikato" and one time Decepticon leadership contender, Bludgeon! 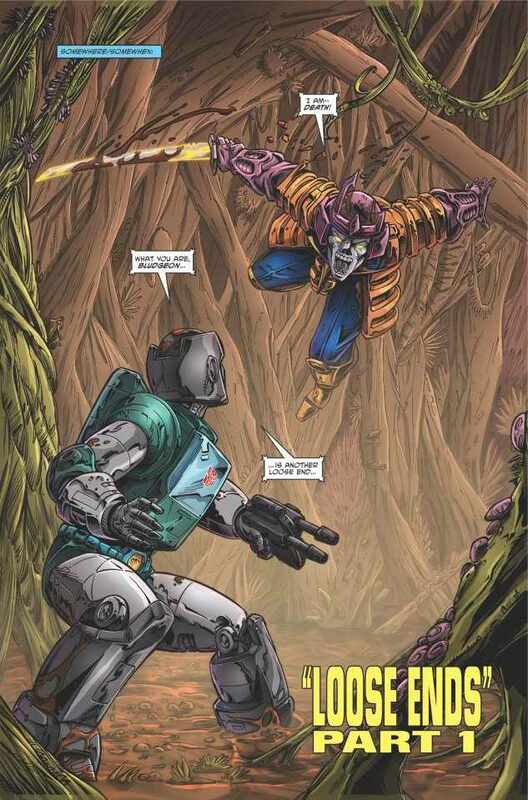 Bludgeon has a plan and he needs Soundwave to help him implement it! Perhaps the Autobots are not as secure in their "victory" as we might believe! 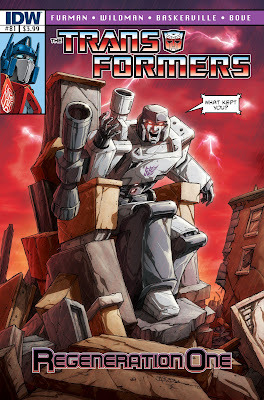 You'll notice I didn't mention the cover-bot of this new series. What of MEGATRON??? Foolish human, that would be giving away too much! At the end of the day I enjoyed this "new" issue of what was once my first comic book. However, I'm just not sure if it'll be a worthy successor to the madness and genius of the original series. That might have been too much a product of it's own era to really ever be added to in this day and age. Regardless, I'll give Transformers: Regeneration One the chance and read at least the first 6 issues in good faith! Who knows, maybe you CAN go home again, if your home happens to be the planet CYBERTRON! Oh, to see the rest of the free 5-page preview, follow THIS LINK to Seibertron.com! Enjoy!